One of EBED’s aims is facilitating research into the social benefits of playing bridge, and an important step has just been taken in this area at the University of Stirling. 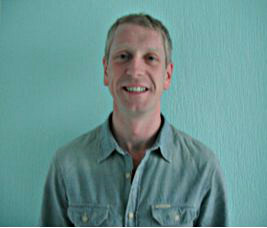 Kevin Judge has recently started an EBED funded PhD in which he will be “researching the game of Bridge through the life course of its players.” The project is in collaboration with EBED, with contributions from the Irish, Northern Irish, Scottish and Welsh Bridge Unions. The objectives of the research are to develop a Sociology of Bridge, and to contribute to the sustainability of the game by doing so. Kevin has started a blog where he posts some of his findings. You can access the blog here sociologyofbridge.wordpress.com/blog. Kevin’s work is being supervised by Samantha Punch, a Professor of Sociology at the University of Stirling and an international bridge player for Scotland. She was recently interviewed for the podcast ‘The Setting Trick: Conversations with World Class Bridge Players,’ about bridge in general, including her research into the Sociology of Bridge. You can download this interview, and the other episodes of the podcast, at www.thesettingtrick.com. Study 2 - can playing bridge benefit the health of the brain? The work is being coordinated by one of our Trustees, Dr Caroline Small, an Honorary Senior Lecturer at Imperial College, London, working alongside Prof. Sam Punch (herself an international bridge player) and her colleagues at Stirling. The first step in the project was a thorough study of all existing work on, and related to, the subject. This literature review revealed the subject to be one with much opportunity for further research. The project has then moved on to encompass original research. A summary of the work to date, and information on one of the forthcoming studies, is available here. The first study was in two parts. The first part (completed in 2017) used survey data to consider, amongst other things, the impact of playing bridge on an individual's sense of wellbeing. It used quantitative methods to analyse the responses, and gave exciting results as it allowed the researchers to demonstrate, for the first time, that playing bridge has a statistically significant positive effect on wellbeing. More information on this study is available below. The second part of the study (completed 2018) adopted qualitative analysis methods to consider the responses to one of the open-ended questions given in the survey. These responses were considered, in order to consider the question 'why do people play bridge'. Prof. Punch summarised the responses as showing that bridge "impacts positively on players' lives in many ways that transcends mental exercise, including friendship, socialising, travel and fun". The second part of the work will aim to address the hypothesis that playing bridge can directly develop and maintain the neuronal pathways in the brain, occurring primarily as a biochemical process in the brain driven by the physical mental activity required to play bridge. We hope to achieve this by performing functional Magnetic Resonance Imaging (fMRI) on a number of bridge players, and appropriate 'controls'. We hope to see if the brain activity of the bridge players differs from the controls. This work will have benefits to the wider society and demonstrate how bridge alters and preserves brain function. These results would promote the health benefits and encourage new players into the game. A delay in the onset of the ageing process by an average of just one year, or a modest 10-15% improvement in mental awareness, has considerable benefits to society. It would generate considerable direct health cost savings in addition to enhancing the quality of life of the population. You can read more about this study on pages 4 and 5 of Dr Small's summary. We are now recruiting volunteers for this study - please see here for more information. This is a not a hypothesis which you can 'prove' through surveys or anecdotal evidence. It requires scientific research to give the robust evidence which would be needed by, for example, governmental departments if they were to support the promotion of the health benefits of playing bridge. This work will therefore not be inexpensive, and we will need contributions from generous donors for it to be completed to optimum effect. We hope that you will be willing to make a donation - large or small - to assist our work. Please donate here. The partnership of EBED, UK and Irish Bridge Unions and the University of Stirling have provided funding for a 3 year PhD Studentship (fees plus living expenses) for the first ever PhD in the Sociology of Bridge: Bridging the Gap: An Exploration of Transitions in Play through the Lifecourse. Understanding what drives individuals to take up bridge and what keeps people playing across the lifecourse is at the heart of this collaborative research project. Bridge provides a contemporary example to understand the role of leisure and mind sports in developing social capital and well-being through community participation at different stages in the lifecourse. This study considers the shared practices and social relations which emerge in the process of learning and playing bridge and how these change over the lifecourse. The research relates to the sociological field of intergenerationality by exploring the role a hobby can play in friendships and personal communities as well as how it can create a sense of belonging and collective identity both within and ‘bridging’ across generations. Qualitative methods including life history interviews and focus groups will be used to engage with people across the lifecourse, exploring the pathways into (and out of) bridge for people of different ages. This work will help to identify how more people can be encouraged to play bridge, but equally importantly how bridge organisations can help to ensure that those who play are enabled to get as much from the game as possible, and thereby access the benefits which have been identified in study 1, and will be researched in study 2. As part of this work Stirling University has established a bridge club, to involve different generations and the local community, and give participants an insight in to the wide ranging benefits that can come from playing bridge. Read the university's press release. Funding for much of this research has come from EBED, which has committed a sizeable portion of the money required to undertake this work. 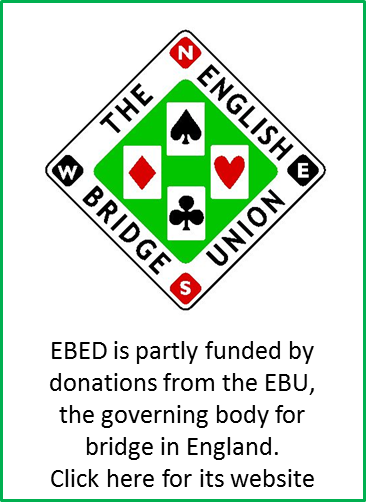 In addition, two simultaneous pairs events were held in 2016, with the entry fees being used specifically to fund EBED's work relating to the social and health benefits linked to playing bridge, including combatting social isolation and cognitive decline. Thank you to everyone who took part, and to the clubs which held heats of those events last May and September. There are also volunteers giving their time and energy, at no cost to the charity, to drive the projects forward. Nonetheless, we still need donations to help us carry out future stages of our work and for it to be completed to optimum effect - the fMRI scanning for study 2 will be the most expensive element of the work, and it is estimated that it may alone cost £40,000. When dealing with research funding there is, however, a significant 'multiplier effect'. Successful applications and projects yield greater returns than the size of the investment, and in the academics at Stirling University we have partners whose body of work, and academic reputation, far exceeds the financial investment needed to work with them. It is only through robust, scientific data that we can 'prove' the claims which relate to the benefits of playing bridge - 'anecdotal evidence' and 'common sense' is insufficient - and thus receive the support of key organisations who can fund, support and promote the development of the game. We therefore believe all this expenditure to be a worthwhile investment, and hope you will support our project.